The crown roast is made from loin and rib chops and usually weighs 8-10 pounds. Tell your butcher what you plan, and when, since he will most likely have to order it. 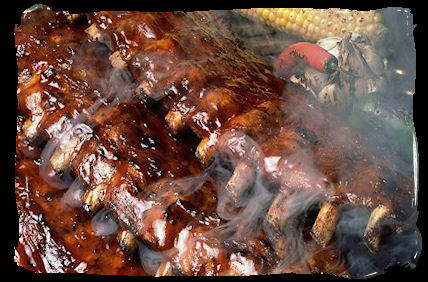 A whole rack will have 8 ribs — a crown of two racks (16 ribs) will feed up to 8 people. He will slice part way through the chops and cut the backbone so that the chops can be easily separated when done. He may scrape away some of the meat from the tip of the rib bone to expose a clean bone – called Frenching. Whether you do this or not, wrap the bone ends with aluminum foil or a little piece of bacon to keep them from burning. If you barbecue, keep the temperature down to around 200, if you roast, you can go up to around 350, but it will also cook to be more juicy down around 250. Don't over cook. When the thickest part of the ham reaches 135, take it off and let it sit for 10 minutes before carving. Prepare the grill for roasting - about 350º degrees, light on the smoke. Simmer for ten minutes and rub well into the roast. Let dry before placing on the grill. Place on the grill, over a drip pan. Baste and close the lid. Check the temperature. Maintain between 250 deg and 300 deg. Baste at 15-20 minute intervals. The roast should be deliciously and beautifully done in 1 1/2 hours. It is rare at 135 deg and should not be cooked beyond an internal temperature of 150 deg. Remove and allow to set for 5 minutes before carving. Serve on warm plates. Lamb cools quickly, but is much tastier warm. Prepare yourself for a religious experience. Variations Because lamb has, for centuries, been favored in many countries and societies, there are an abundance of different sets of seasonings. The traditional combination of garlic and rosemary is popular on the Northern shores of the Mediterranean. The Southern shores and the Middle East use a variety of unusual seasons.